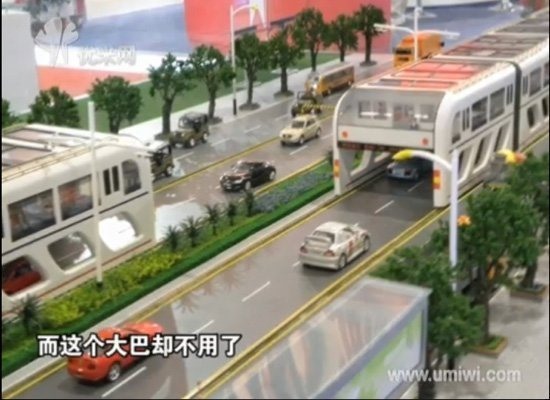 The gigantic bus will allow cars less than 2 meters high to travel underneath the public transport. Construction of the first 115 miles of track is scheduled to begin in Beijing's Mentougou district at the end of 2010. "Proposed by Shenzhen Hashi Future Parking Equipment Co., Ltd, the model looks like a subway or light-rail train bestriding the road. It is 4-4.5 m high with two levels: passengers board on the upper level while other vehicles lower than 2 m can go through under. Powered by electricity and solar energy, the bus can speed up to 60 km/h carrying 1200-1400 passengers at a time without blocking other vehicles' way. Also it costs about 500 million yuan to build the bus and a 40-km-long path for it, only 10% of building equivalent subway. It is said that the bus can reduce traffic jams by 20-30%." Click through for video and correlating translation. Seriously, what will they think of next? Thanks for the link, JD Coverly. Inspired by something? Send it to rmansur@wonderhowto.com. What a brilliant idea... seems like the initial investment would be high, but this could be expanded for much less money than a light rail.... until you need to add more lanes that is. I wish they would do this in the US, really cool system. The only problem I see is that in China there are a ton of motorbikes and regular bikes in traffic like in Shanghai and they usually use the sides of the roads to travel. They are going to really have to educate the cyclists to not get run over by these massive buses.